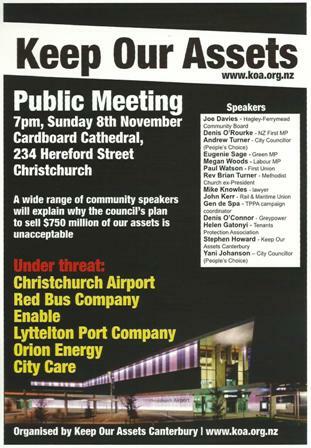 Keep Our Assets Canterbury hosted a public meeting on Sunday night in the Cardboard Cathedral. The message from the 13 speakers (who were given five minutes each) was quite unambiguous – if the Christchurch City Council proceeds with its plan to sell $750 million worth of public assets over the next three years, it will have a fight on its hands. Two of The People’s Choice’s six Councillors spoke and made plain that this will be a major issue at the 2016 local body election. This was reinforced by the three MPS who spoke – one each from Labour, the Greens and New Zealand First. The representatives of two unions who spoke made the stark point that privatisation costs workers’ lives. those assets were built up by previous generations for the common good of present and future generations of Christchurch people, not to be flogged off because of an ideologically-induced debt hysteria, and certainly not to pay for the white elephant anchor projects with which the Government is hellbent on imposing upon us. The point was well made that it is not an asset sale programme but more of an asset transfer one – namely, selling productive and useful assets in order to pay for unproductive ones whose starting dates keep receding into the nevernever and for which no business plan has ever been produced. In the process Big Business, most likely transnational corporations, will become the new owners of our public assets. 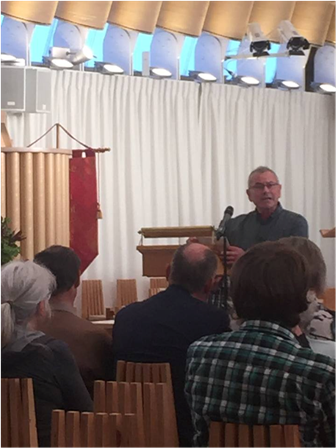 The speaker from the campaign against the TPPA pointed how that Agreement, if signed, will adversely impact on Christchurch and its public assets. This is a battle that is far from over.